Recently one of my focuses has been to find a way to make the PCB creation process easier. 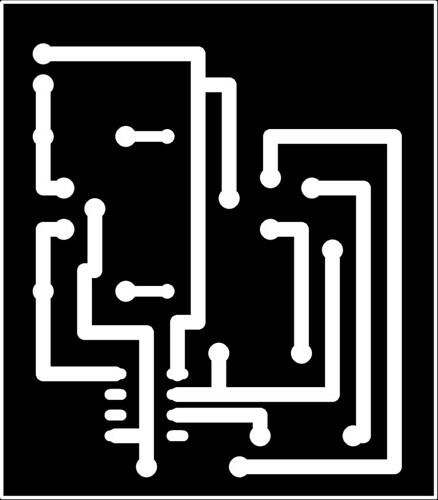 I like being able to design something based on what I want in a circuit and just making it myself on the random weekend. While the toner transfer method has been my go to in the past it’s just not nearly as consistent as I would like it to be. The specific pressure of the iron and timing both make it a hit or miss approach. I’m not a fan of hit or miss I like to know something is going to work every time I try to do it. This sentiment got me exploring new ideas for PCB creation which is the topic of this page. I’m not the only one in my house who likes to have multiple projects going on at various times and as such we’ve accumulated some different tools and machines and such. One of those machines my mom uses for scrapbooking and creating vinyl stickers for water bottles and other random things she decides to work on. Some of you may know what I’m talking about already, but for those that don’t the machine is called the Cricut Personal Electronic Cutter. 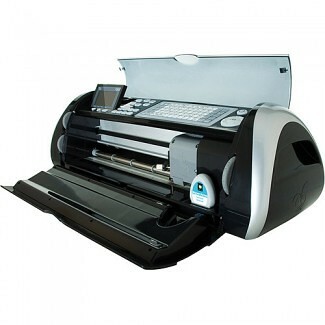 Essentially this machine is a consumer tabletop CNC that cuts craft paper or a vinyl sheeting with a sharp blade according to patterns that you choose from preprogrammed memory cards. Hopefully that picture gives everyone a good idea of what I’m talking about at this point. With that machine sitting in our house I started to think about the possibility of using it to cut out various things including a vinyl resist for creating PCB’s and possibly solder paste stencils a bit further down the road. 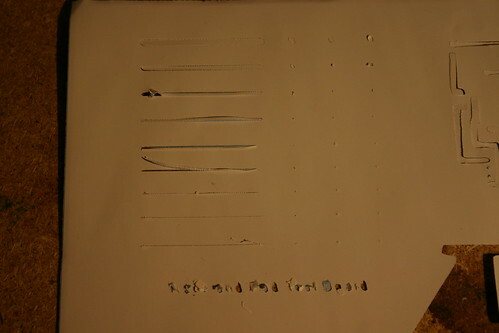 So my questioning left me with three things to confront: first, could I get the Cricut to cut something I designed rather than something from the preprogrammed cards; second, would the Cricut have a good enough resolution to create usable resist patterns; and third, would the vinyl resist stay on the copper clad board and protect it from the etchant properly? With those three things outlined I began to move forward with the first phase of the problem. This was the biggest hurtle obviously seeing as without the ability to cut custom shapes my entire project idea was sidelined from the start. The search took me a few days, but ultimately I found a program called Sure Cuts A Lot which, if you can get a copy of version 2, allows the Cricut to cut custom shapes via a USB cable. It was pretty simple to get everything running once I found that program and tracked a copy of it down from some other scrapbooking people. Luckily the Cricut was the right model and had the correct firmware so that all I had to do was install the program on my laptop and plug it in. From there I started to look at the resolution of cuts the Cricut could make to see how useful this new program would be. Before I could test the cutting ability of the Cricut I had to find some things to cut with it. At this point I thought it would be good to create three things to test: a larger image, an actual circuit board, and a test board to see how small the pads and traces could be. With that in mind I created three .SVG files for the Cricut to cut out, two of which you can see in the images below (For the larger image I used the Monster Energy Drink logo because I thought it might look kind of cool as a sticker or PCB). Finally I had a way to cut custom shapes and a few things to try the capabilities out with. So at this point I loaded up the .SVG files into Sure Cuts A Lot and started cutting. For the Monster Energy Drink logo I got very good results as it was somewhat larger. For my other two cuts however I ran into some problems. 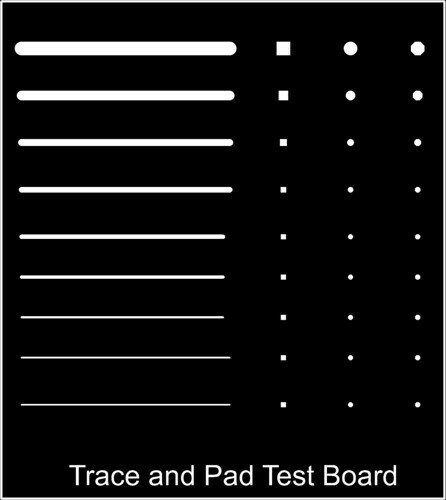 The trace and pad test board had the most issues of the two which I kind of expected. 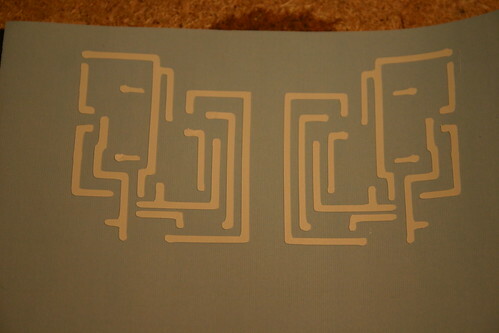 I purposely made some very small traces and pads just to see what the Cricut was capable of. Unfortunately most of the traces were just slashed up mess and all of the pads were converted into circular shapes rather than being three distinct shapes as I designed them. The programmer’s problems were kind of easy to expect after seeing the test board, but I cut it anyway. The problems were with some of the smaller pads where I was using an IC as well as a few other areas where pads were just blended into the traces. So overall as you can see in the images above the cuts were usable, but not the greatest ever. As such I sidelined etching the test board and programmer my reasoning being consistency again and to not waste any copper clad board. I’m hoping to start looking more into SMD components so I want to get as accurate a result as possible for these boards and the Cricut just wasn’t supplying that in these tests. 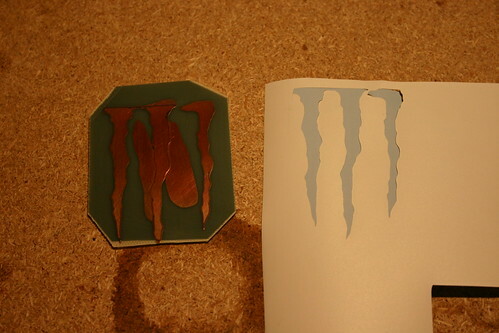 I was still curious however if the vinyl would even protect the copper clad board from an etchant so I went ahead and tested this with the Monster Energy Drink logo for the fun of it. I cleaned the copper with some acetone and a Scotch-Brite pad and then dried it before sticking the vinyl to the surface. The vinyl adhered well to the copper surface and I dropped the board in some Ferric Chloride to see what happened (I did this outside as I was unsure what might happen or if some unknown reaction might take place). Luckily for me the etchant didn’t eat through the vinyl and the board etched properly. I say properly, but as you can see from the image below I got a bit tired of waiting and stopped the etching early since it was just a test and my point was proven. So while the experiment didn’t go exactly as planned it was a pretty good proof of concept. Obviously this technique is more useful when etching something of a bit larger scale, but I feel like in the future I may come back to it. I find myself etching logos and different things occasionally for backlit elements and I think this is a perfect method for that. Another plan for this method is glass etching some time in the future seeing as the vinyl should also resist the etching creams used in that type of project. As with many projects things may not have worked out 100% according to plan, but I can still make this work for some kind of interesting other project later down the road I’m sure. Make sure to leave a note in the comments section if you can think of some other interesting ideas and I’ll try them out and let you know how things go. Found this via Google, thanks for posting it. I’m having a helluva time tracking down Sure Cuts A Lot v2 but I’m still trying. My wife is making some wedding bouquets and none of the available cricut modules have what she’s looking for.